If you're sick of the standard round or oval shaped running boards, check out the APS 5" Brushed Aluminum IBoards! They are a sleek, low profile board offering a wide 5" stepping area. 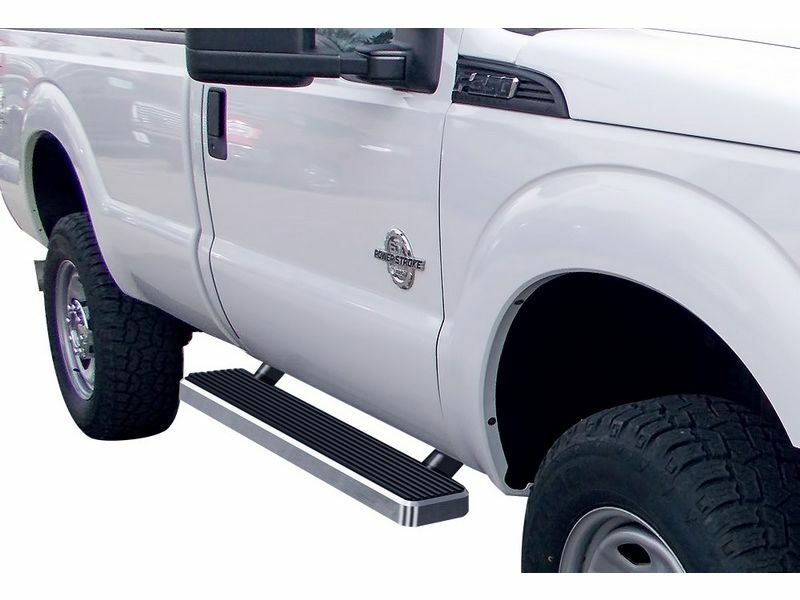 UV resistant and non-slip stepping pads ensure you will safely get in and out of your rig whether rain or shine! IBoards are constructed of 6061 aircraft aluminum which means these bad boys are rust resistant and strong enough to provide you many years of use. Offered in a brushed polish finish to fit your rides style. APS makes these a solid, one piece design that was inspired by iPhones. So not only are you installing a set of boards that looks cool, but you are providing yourself a more secure step into your cab. APS 5" Brushed Aluminum IBoards offer a quick and easy installation. Normally it takes around an hour to have installed. Once installed, get out and show 'em off! So, what are you waiting for? Get yours today! APS 5” IBoards are backed by a one year warranty covering all defects in materials and workmanship. Install the APS 5" Brushed Aluminum IBoards yourself in the comfort of your own garage! It is an easy, DIY process. We suggest setting aside around an hour of your time for installation. Most applications require no drilling on most models, but installation instructions will be provided to ensure a proper install.